Nearly half of all political advertising aired in Iowa this month attacked Republican presidential candidate Newt Gingrich, according to a new analysis, indicating that the barrage of critical ads Gingrich faced may have contributed to his fall in the polls. According to the media research group Kantar Media, 45 percent of all advertising in Iowa since December 1 were critical of the former speaker. It's not surprising the other candidates and their supporters would target Gingrich, given that he had surged to the top of the polls by the beginning of this month -- a December 6 CBS News/ New York Times poll showed Gingrich polling at 31 percent in Iowa, with a double-digit lead over Mitt Romney. But the negative advertising appears to have done some damage. 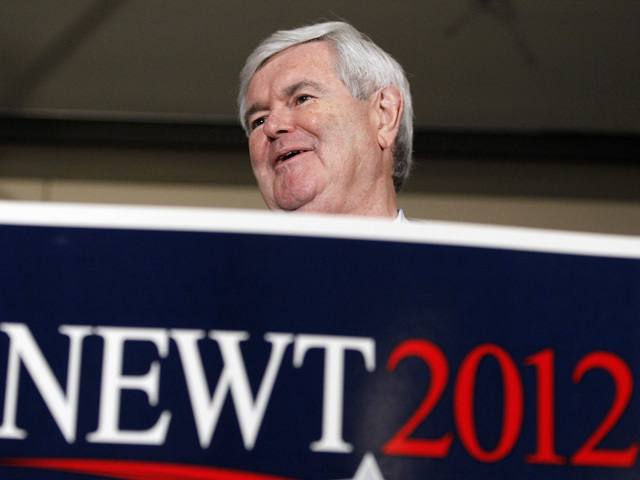 A new NBC/ Marist poll released today shows Gingrich trailing in fifth place in Iowa with just 13 percent support. Though Romney has stayed relatively high up in the polls, just 20 percent of Iowa ads this month targeted the former Massachusetts governor -- and many of those attacks were included in ads that attacked multiple candidates at once, according to Kantar. At an event in Des Moines today, Gingrich said his "willingness to endure the beating" he's taken on the Iowa airwaves speaks to his character. "Just the willingness to stand there and take that, because I think the future's that important, that says something about which of the candidates has character, and which of the candidates doesn't," he said. "Now I'll let you decide if the person who has been honest and straightforward and positive has more character than the person that hired guns to go out and run ads that are false and misleading." Of the negative ads, he added, "I wouldn't vote for the person they're describing." Meanwhile, in an interview with NBC today, Romney downplayed the impact of the attack ads his campaign and supporters have run against Gingrich. "The nature of a campaign is that you're going to have attacks coming from the Obama team, their super PAC has already gone after me, the Obama PAC has," he said. "If you can't stand the heat in this little kitchen, wait until you get Obama's kitchen."